Tesla Gets A Semi. | | A Wheel Thing. It’s been hinted at, guessed about, and now it’s for real. Tesla has given us a semi. 2019 is the year that is currently scheduled for first delivery and reservations are currently being taken in the US for just five thousand American dollars. Tesla has unveiled the new truck at a lavish event and simply stated, the design and specifications are stunning. Has an autonomous convoy mode, where a lead truck can control following trucks.Tesla has also changed the way we view a semi, with the cabin designed to be driver-centric, and with stairs to allow better entry and exit from the cabin. The cabin itself will allow standing room and for the driver two touchscreens for ease of use and providing extra information at a glance. Tesla has also revealed a throwback to their origins, with a revamped Roadster. It’s also some numbers that, if proven, are truly startling. Consider a 0-100 kph time of 1.9 seconds, a standing 400 metre time of 8.8 seconds, 0 – 160 kph of just 4.2 seconds, over 250 miles per hour top speed and a range of over 600 miles. It’ll be all wheel drive, a four seater, have a removable glass roof, and will start at a current mooted price of US$200000. Information provided courtesy of Tesla. 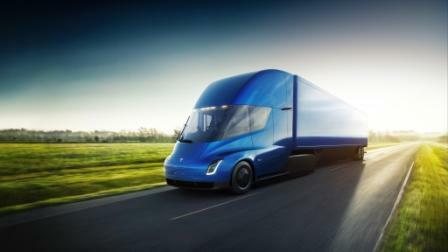 Be the first to comment on "Tesla Gets A Semi."